Zion Market Research recently released a report detailing an estimated increase in the value of the global thermostats market. In 2017, it accounted for $1.29 billion (€1.14 billion) and it is expected to reach $7.90 billion (€6.97 billion) by 2024 – a whopping 29.5% increase. Smart thermostats allow users to control their home’s heating settings from a smart device. This allows them to control when and for how long they have their heating on, and at what temperature. The number of households using smart thermostats has increased as more homeowners have started benefiting from reduced energy consumption. In particular this has decreased household energy bills. A Nest smart home can save customers approximately 15% of their heating bills a year. The huge growth of the global thermostats market can be attributed to understanding better ways to manage the cost and consumption of energy. Smart technology in general is becoming more widely used as it can be applied to different appliances in the home. Modern homes are now being built to accommodate the evolving technology. This is a result of a significant increase in the demand for Internet of Things (IoT) technology, with a study from Judopay showing that 91% of participants were interested in the idea of a connected home. A total of 35% said that they were likely to purchase a smart heating device. The overall intent to purchase smart technology was also high, with more than 50% saying they intend to invest in a smart home in the next five years. 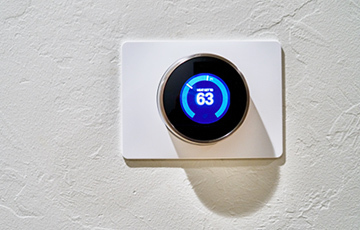 IoT Business News detailed the growth of the market in North America, with reports of a 64% growth in the installed base of smart thermostats. Some of the major factors affecting the growth of the market include high disposal income, the significant penetration of smart home solutions, and high technology adoption rate. The United States is the largest market in North America and is currently predicted to remain at the top through the entire forecast period. Europe has the second highest market share even if smart home technology is still in its infancy in the European market. The continent is predicted to experience exponential growth in the coming years because of the already widespread use of the internet in European households. Leading smart thermostat vendors include the European-based eQ-3, who have installed smartphone controlled radiator thermostats in more than 350,000 homes. In the UK, Centrica-owned utility British Gas already has 550,000 smart thermostat users. What’s evident from the variety of smart thermostats on Screwfix is that there are a number of high profile companies in the UK, including Honeywell and Hive, wrestling for market dominance in this growing industry. It is for this reason that the UK is the fastest growing market in Europe for smart technology. The increasing demand for smart thermostats doesn’t come without its fair share of challenges though. In September last year, internet-enabled thermostats from Honeywell had server issues that left consumers unable to control their temperature through the app. Customers flooded Honeywell with complaints, demonstrating how the technology is still evolving. There is also the public concern that smart heating and ventilation systems are at risk of a cyber attack. Any connection to a network carries the risk of a security or privacy breach. The worst case scenario is that hackers could take control, manipulate, or disable ventilation systems rendering them useless and causing chaos where homeowners are concerned. Despite these concerns there is no stopping the increasing market for smart thermostats and other types of smart technology. Many see these devices as not only beneficial to them personally, but as a way to be more sustainable and environmentally friendly.